Landscape artist and writer Dave Hall has put his Blaine Creek home back on the market. The house is ten miles upriver from Ennis. 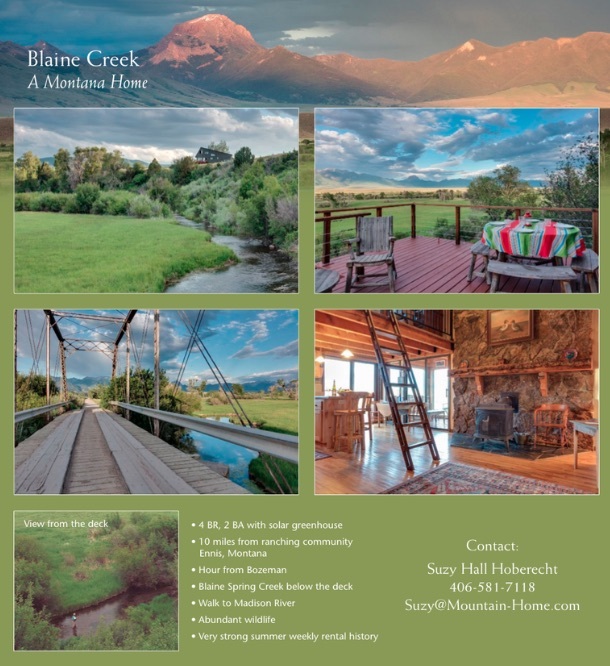 The house, a solar envelope design, sits on a bluff overlooking rustic Varney and Blaine Creek bridges, a large, lush hay meadow and the Madison River, with the peaks of the Madison Range beyond. Blaine Spring Creek has its source a few miles upstream at the Ennis National Fish Hatchery and flows through the property. The views are spectacular.